During my mother’s final days, Carolyn, a dear cousin, opened her home to me so that I could be with Mother as often as I was physically able to make the trip to Hattiesburg, about 90 miles from our home. She not only housed me, but she fed me, helped me cope with my personal care challenges in a new environment, ferried me back and forth for the 30 something miles from Mother’s apartment in Hattiesburg to Carolyn’s home, and even stayed with Mother and me. But that’s not all. 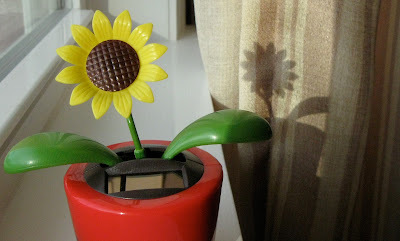 One morning, as Carolyn and I were eating breakfast before heading to Mother’s, I noticed a little ceramic sunflower in a tiny pot on her windowsill. Carolyn told me the story of how the cheery little flower came into her possession. But she also told me to watch closely. The sun was coming up and was soon shining on the sunflower. It was a “solar” sunflower. The blossom started waving side to side and the green leaves moved up and down. Carolyn said it always brightened her mood when it started waving at her. Mine, too. A bubble of laughter tickled its way out of me, and I felt comforted and more peaceful the whole day. I have never seen anything like this solar flower, and I even like the shadow of it, too. I have just been catching up with you, and how I am enjoying seeing your beautiful smile...you had your own resurrection this Easter, and are really a walking miracle. And that is worth more than a smile. I think you are coming back better than ever!!!!! I've seen something similar to this before, and thought it was neat! How kind of your sweet cousin to help you out like she did, she's an angel among us. I love things like that! Gadget goober, that's what I am! I've never seen one of these. I think that would be a very cool gift to give someone who needed a smile each day as the sun came up. Your cousin is such a dear person. I agree with Kathy; she is an angel among us. God places people and moments of joy in our lives at just the right time, doesn't he? I'm wondering where Carolyn found the cute sunflower; it would be great to have in my sunny kitchen window. Hope you have a joy-filled weekend! the flower is amazing, have not seen one of these before. i love all things sunshine and daisy's are my favorite flowers. What a sweet friend and comfort your cousin is. I love that little flower and will probably google it today. Oh how fun, that little flower would make me smile and brighten my day as well. What a delightful sunflower. I think its as delightful as your dear friend. Where would we be if we didn't have friends like Carolyn?